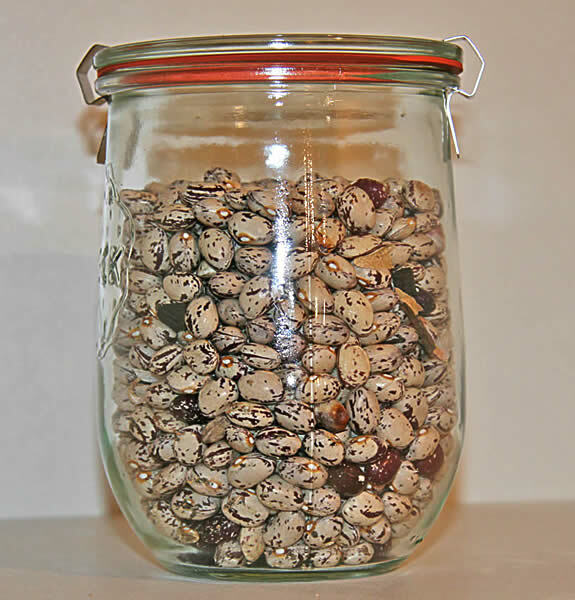 Borlotti beans in jar, money in the food bank. And more tomatoes and zucchini sliced and in dehydrator. Aren’t borlotti beans just special? I’ve grown a few crops of them now, and just love them. We make a recipe that we pinched from Jamie Oliver in his ‘at home’ series. Basically you just boil them up in a pan with some celery, a tomato, and a potato. By the time the beans are done, the rest boils down into this mush which makes the sauce/gravy to go with – it’s awesome. They are beautiful.. They look like a jar of speckled eggs..
My question is where did you get the jar from? I love the shape and the closing clips. All other jars I have seen have a narrow neck and when you have big hands like I do, you can’t fit and washing them becomes a hassle. They are called weck jars, but mason jars are almost as good (and come in larger sizes). You can buy them here: http://www.redbacktrading.com.au/index1.html Good site for preserving stuff in Australia.